Escallonias are the sort of quiet, unassuming evergreen shrubs that I usually rescue from the bargain bin or on the sale table at the nursery. They are dependable and extremely useful shrubs - and when in flower, extremely beautiful. One particular find has been a golden leafed Escallonia, which I grow in several garden areas. One looks particularly beautiful perched (?) on the edge of the Shrubbery's stone wall. 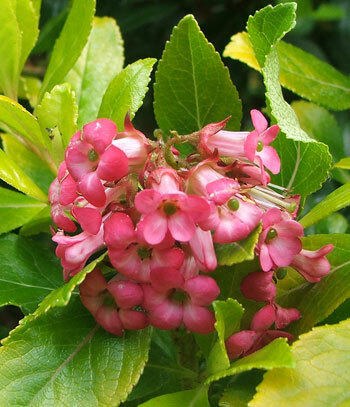 Its flowers are a darkish cherry-pink, and the foliage a clean golden green. 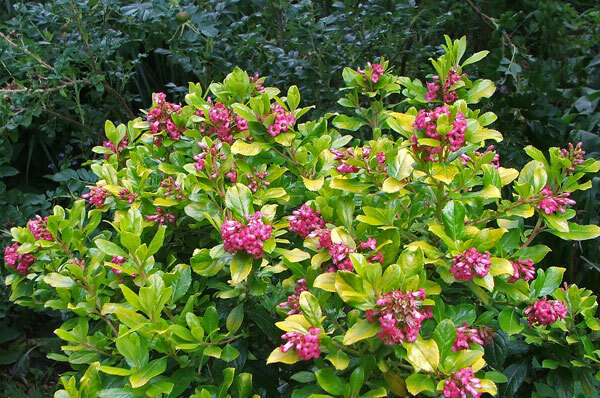 This shrub will lighten up a border without being garish. I suspect that Escallonias have a boring shrub-image - but hey! Boring usually means well-behaved, brilliant for a busy gardener with lots of space and little money. And the golden leafed variety is definitely one of my favourites.